52690-SN is rated 4.4 out of 5 by 5. 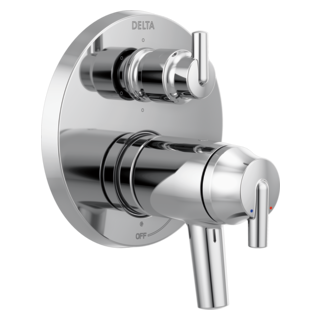 Rated 3 out of 5 by IKelly from Delta 52690 H2Okinetic 1.75 GPM Multi Function Rain Shower Head Bought with the hand held sprayer. Use the hand held more because not great spray or massage coverage with the wall mount. Very hard to get a good body/hair rinse with wall mount. Rated 5 out of 5 by barbt from so good we bought two We installed two of these heads in our shower, one set from above to act as a rain shower, and one at an angle from the wall to serve as a standard shower head. We love how easy it is to switch between settigs. 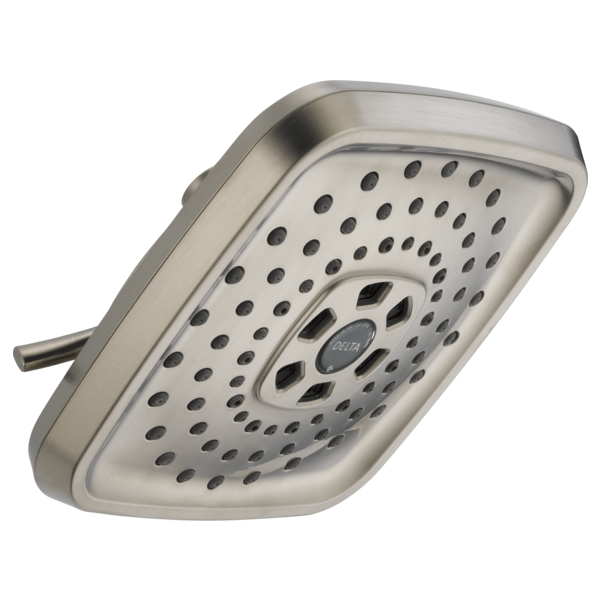 Rated 5 out of 5 by Dennis513 from Works Perfect Highly Recommend This Product The shower head was used in our bathroom with a rain shower configuration and it works perfect. 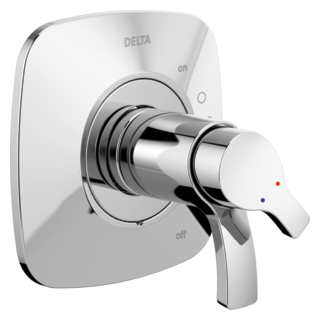 Allows easy change of water type flow. I plan on buying another one for our other bathroom once we remodel it. 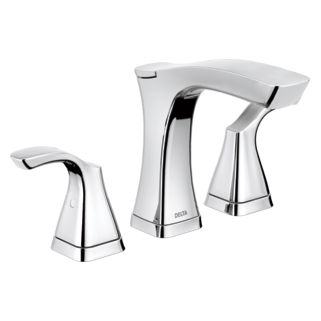 Rated 4 out of 5 by hjkommel from Not impressed with the flow The features (the three settings) are nice and it is good-looking, but I am not impressed with the flow. My showers now take longer because it takes longer to get my hair wet, and to rinse it. The description says "sculpts water into a unique wave pattern, forming a powerful drench spray" and "Gives you the feeling of more water without using more water," but this is more poetic license than truth, in my opinion. Rated 5 out of 5 by UFalumBC from Awesome! 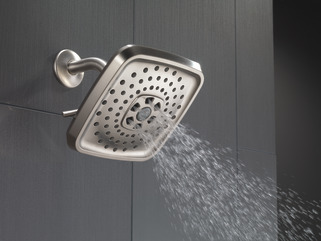 It's difficult to find a rainshower-type showerhead that still provides enough fluid velocity to make it functional in a typical configuration (wall, vice overhead). This not only does so, but does so with both functions! Whether I'm using the H2O Kinetic setting or the standard rainshower setting, there's plenty of water...so much so that I thought there was no way this was actually a 2GPM showerhead. The "pause" function is okay. It doesn't stop all the water (still sort of trickles out and goes straight down), but in truth, I don't really use it anyway. The spray features are so good that even if I did use this function, I'd still choose this showerhead over others. Ultimately, I liked it so much that I bought one for every shower in my house! Hi! I recently installed 2 of these shower heads, and noticed that water does not come out of several holes on either head when in normal shower mode (same holes on both heads which are slightly larger than other holes). Is this by design? Why? Thanks! Thanks. That is just the arm. What is the flange part # please? What arm and flange go with this product? 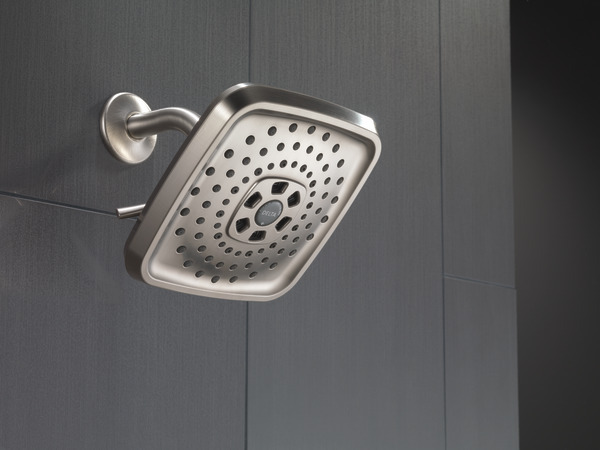 Is this shower head made of metal or plastic? We have an 8 ft ceiling. Can it be ceiling mounted? What arm? 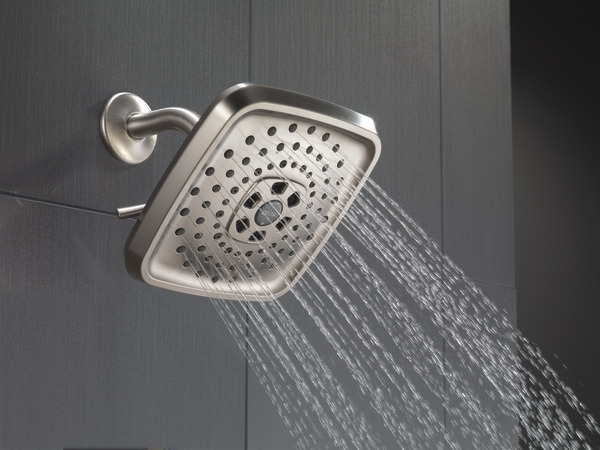 What is the diameter of this shower head? I'd like to have a right angle shower arm mounted on my wall for this shower head, ideally in a Stainless Steel or Brushed Nickel finish. Could you please provide any recommendations?